Steel reinforcement bar is also known as rebar, reinforcing bar, reinforcing steel and reinforcement steel. It is a versatile constructional material which is widely used in the construction industry for making of the reinforced concrete. Reinforcement concrete (RC) is a composite material made up of concrete and some form of reinforcement – most commonly steel rods, bars, wires or mesh of steel rods and steel wires. The steel reinforcement bars usually consists of such shape and size that they may easily be bent and placed in the concrete so as to form a monolithic structure. The properties of thermal expansion for both steel and concrete are approximately the same. This along with excellent bendability property makes steel the best material as reinforcement in concrete structures. Another reason steel works effectively as reinforcement is that it bonds well with concrete. When passive reinforcement (steel bars) is employed, the structure is known as reinforced concrete structure. In pre-stressed concrete structure, the reinforcement (steel wire) is stressed prior to subjecting the structure to loading, which may be viewed as active reinforcement. Passive steel reinforcing bars, also known as rebars, should necessarily be strong in tension and, at the same time, be ductile enough to be shaped or bent. Steel rebar is most commonly used as a tensioning devise to reinforce concrete to help hold the concrete in a compressed state. Concrete is a material that is very strong in compression, but virtually without strength in tension. To compensate for this imbalance in a concrete slab behavior, reinforcement bar is cast into it to carry the tensile loads. The surface of the reinforcement bar may be patterned to form a better bond with the concrete. Reinforced concrete gets its strength from the two materials, steel and concrete, working together. To get them working together, it is critical that the steel be adequately bonded to the concrete. Achieving this bond is called developing the bar, and many aspects of reinforcement design are geared toward achieving development. Steel rebars are the time proven match for reinforcing concrete structures. RC structures are designed on the principle that steel and concrete act together to withstand induced forces. The aim of the reinforced concrete designer is to combine the reinforcement with the concrete in such a manner that sufficient of the relatively expensive reinforcement is incorporated to resist tensile and shear forces, whilst utilizing the comparatively inexpensive concrete to resist the compressive forces. To achieve this aim, the designer needs to determine, not only the amount of reinforcement to be used, but how it is to be distributed and where it is to be positioned. These decisions of the designer are critical to the successful performance of reinforced concrete and it is imperative that, during construction, reinforcement be positioned exactly as specified by the designer. Originally concrete structures were made without reinforcement. The use of rebars has started in construction since at least the 18th century. Earlier cast iron was the materials for the rebars. This was because cast iron rebars were of high quality, and there was no corrosion on them for the life of the structure. Later the technique was refined by embedding the steel bars in the reinforced concrete structures. Plain mild steel rebars of strength 250 MPa were used widely till about 1960s. Square twisted steel bars (deformed bars) were introduced in 1960s. But these were phased out due to their inherent inadequacies. Later the steel rebars of high yield strength were produced by raising carbon as well as manganese contents. After this high strength was incorporated to the steel rebars to a great extent by cold twisting. The cold twisted deformed (CTD) steel rebars were produced by cold working process, which was basically a mechanical process. It involved stretching and twisting of mild steel bars, beyond the yield plateau, and subsequently releasing the load. CTD round rebars having yield strength in the range of 415 MPa were introduced in the late 1960s. Since then, there has been an increasing demand for high strength deformed bars. Quenched and self tempered (QST) steel bars were introduced during late 1970s. These steel bars are popularly known in India as thermo mechanical treated (TMT) steel rebars. Quenching and self tempering treatment of the steel rebars is a heat treatment process in which hot steel bars coming out of last rolling mill stand are rapidly quenched with water. Rapid quenching provides intensive cooling of surface resulting in the steel bars having hardened surface due to the martensitic structure with hot core. The steel rebars are then allowed to cool in ambient conditions. During the course of such cooling, the heat released from core tempers the hardened martensitic structure of the surface while core is turned into a ferrite pearlite structure. This quenching and self tempering process thus changes the structure of material to a composite structure of ductile ferrite pearlite composition in core and tough surface rim of tempered martensite providing an optimum combination of high strength, ductility, bendability and other desirable properties. The steel reinforcing bars can be produced with strength of 415 MPa, 500 MPa, and 550 MPa and even higher. Quenching and tempering treatment can also be given to steel rebars having composition strengthened with micro alloying. Fig 1 gives typical cross section of steel rebars produced by quenching and self tempering. For engineering a sound and durable concrete structure, it is essential to use reinforcement of appropriate characteristics and quality. Characterization is a process to control and ensure the quality of a material. Principal objective of characterization of a material is to ensure that it possesses the requisite properties necessary for its intended engineering usage. Properties of steel rebars are influenced by the chemical composition of the steel from which it is manufactured. Characterization is generally performed by checking the chemical composition and certain specified physical properties. The particular chemical ingredients and physical properties, which are selected for characterization, again depend on the attributes of the material that are important for its specified application. Characterization of steel rebars is as important as that of concrete for a sound RC structure of desired strength. Characterization of steel reinforcement bars is important for design. Clear understanding of mechanics of reinforced concrete structures helps in understanding the intricacy involved with the characterization of rebars. Moreover, basic knowledge on manufacturing process of steel helps in appreciating various facets of the characterization. Steel reinforcement bars are normally divided into primary and secondary reinforcement as given below. However there are also other minor uses. • Primary reinforcement refers to the steel which is employed to guarantee the resistance needed by the structure as a whole to support the design loads. • Secondary reinforcement is also known as distribution or thermal reinforcement and is employed for durability and aesthetic reasons, by providing enough localized resistance to limit cracking and resist stresses caused by effects such as temperature changes and shrinkage. • Steel rebars are also employed to confer resistance to concentrated loads by providing enough localized resistance and stiffness for a load to spread through a wider area. • Steel rebars may also be used to hold other steel bars in the correct position to accommodate their loads. Steel has an expansion coefficient nearly equal to that of modern concrete. If this were not so, it would cause problems through additional longitudinal and perpendicular stresses at temperatures different from the temperature of the setting. Although steel rebars have ribs that bind it mechanically to the concrete, it can still be pulled out of the concrete under high stresses, an occurrence that often accompanies a larger scale collapse of the structure. To prevent such a failure, steel rebars are either deeply embedded into adjacent structural members (40 to 60 times the diameter), or bent and hooked at the ends to lock it around the concrete and other steel rebars. This first approach increases the friction locking the steel rebars into place, while the second makes use of the high compressive strength of concrete. Placing and fixing of reinforcement into the forms for the structure is one of the most important aspects of the construction of a structure. Cover has the most significant effect on the long term durability of reinforced concrete and therefore of the structure. Excess cover should be avoided as micro cracking due to bending stress can result in the growth and development of cracks and resulting corrosion of reinforcement or member loss due to spalling. The correct cover is required to ensure that reinforced concrete members meet their specified design requirements. Common steel rebars are usually made of unfinished tempered steel, making it susceptible to rusting. Normally the concrete cover is able to provide a pH value higher than 12 for the avoidance of the corrosion reaction. Too little concrete cover can compromise with this protection through carbonation from the surface, and salt penetration. Too much concrete cover can cause bigger crack widths which also compromises the local protection. As rust takes up greater volume than the steel from which it was formed, it causes severe internal pressure on the surrounding concrete, leading to cracking, spalling, and ultimately structural failure. This phenomenon is known as oxide jacking. Lack of cover on parapet anchors/starter bars results in loss of durability, pop outs and corrosion of steel reinforcement bars. Reinforcement steel bars can also be displaced by impacts such as earthquakes, resulting in structural failure. The shaking of the earthquake causes rebars to burst from the concrete and buckle. Updated designs, including more circumferential rebar, can address this type of failure. Steel rebars can be made with various levels of ductility. The more ductile steel is capable of absorbing considerably more energy when deformed – a behavior that resists earthquake forces and is used in RC design. The welding of reinforcement is generally not permitted for high tensile steel, since heating of hot rolled bars causes brittle fracture in the reinforcement. In the case of cold worked deformed (CTD) steel bars, heating causes the reinforcement to revert to mild steel as it loses the effects of strain hardening. Welding is normally permitted on mild steel and in some cases quenched and self tempered steel rebars. The steel reinforcement bars delivered to the construction site must be stored neatly in a location specially prepared for this purpose. The steel reinforcement bars are to be stored on a platform off the ground to prevent corrosion and contamination due to deleterious matter (mud, grease, oil, paint, loose rust, etc). If the steel reinforcement bars are to be stored for a long period of time or are stored in a marine environment (within 10 km of sea) the steel reinforcement bars piles need to be covered. The condition of the steel reinforcement bars are to be preferably checked in the storage area before delivery to the point of use. The steel reinforcement bars are to be clean and free of all deleterious matter and cleaned by means of water jetting, degreasing or other method if required as the presence of the above have an adverse effect on the bond of reinforcement to concrete. It is very important that steel reinforcement bars are not corroded to the point that pitting of the bars is evident. Pitting is a potential flaw which under cyclic loading can reduce the life of the structure significantly. If pitting of steel is greater than that permitted, the steel reinforcement bars must be rejected. Bending dimensions of the steel reinforcement bars are to be frequently checked to ensure that the bars fit into the formwork and provide enough cover. The inside radius of bends is very important to ensure that the bars are not overstressed during bending. • Steel reinforcing bar – It is a steel product with a circular or practically circular cross section which is suitable for the reinforcement of concrete. • Ribbed steel reinforcing bar – It is a steel reinforcing bar with at least two rows of transverse ribs, which are uniformly distributed over the entire length. • Nominal cross sectional area – It is the cross sectional area equivalent to the area of a circular plain bar of the same nominal diameter, d (i.e. ?d²/4). • Longitudinal rib – It is a uniform and continuous protrusion parallel to the axis of the steel reinforcing bar. 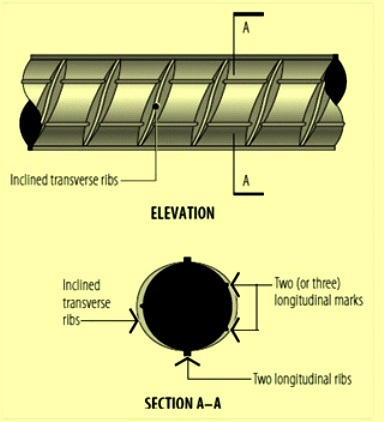 • Transverse rib – It is a rib on the surface of the steel reinforcement bar other than a longitudinal rib. • Transverse rib flank inclination angle – It is the angle of the rib flank measured perpendicular to the longitudinal axis of the rib. • Transverse rib inclination angle – It is the angle between the axis of the transverse rib and the longitudinal axis of the steel reinforcement bar. • Rib height – It is the distance from the highest point of the rib (transverse or longitudinal) to the surface of the core, to be measured normal to the axis of the steel reinforcement bar. • Rib spacing – It is the distance between the centres of two consecutive transverse ribs measured parallel to the axis of the steel reinforcement bar. • Relative rib area – It is the area of the projection of all ribs on a plane perpendicular to the longitudinal axis of the steel reinforcement bar divided by the rib spacing and the nominal circumference. • Standard property – It is the property which is determined as part of the routine inspection and test requirements. • Special property – It is the property which is not determined as part of the routine inspection and test requirements. (e.g. fatigue properties).